So what's wrong with the mains? Well, anyone who has read Ben Duncan's seminal collection of papers on "Audio Quality Mains Supplies" will realise it's possible to write 60+ pages on the subject and still scratch the surface, so forgive me if I make a very brief mention of the nasties in question. Please note that these are based around Duncan's paper and so concentrate on British mains power, no doubt there are better and worse systems around. What a 1:1 transformer (which is what an isolating transformer is) will not do is keep the national grid from wavering from it's nominal 220/240 v (I've measured between 218 and 238v at home) or isolate your equipment from variations in mains frequency - nominally 50 Hz. I know the latter will surprise people used to the idea that a massive generating capacity of linked generators must run exactly to 50 Hz, but sadly this is not the case. The 50 Hz standard is a statutory running average for a 24 hour period and so sometimes a lagging average is 'hurried along'. Shorter-term changes are also caused when new alternators are added before they are settled and have to come up to and synchronise speed, this introduces strong load variations. So what will an isolating transformer "filter"? A good one should significantly reduce interference from 'Spikes' (e.g. those caused by motors arcing), Static (from continuous arcing of things like fluorescent lights), Whines (generally motors), and most other picked up noise (EMI) on the mains - this can be radio broadcasts, military establishment (Radar is terrible! ), passing cars, just about anything that uses electricity somewhere. 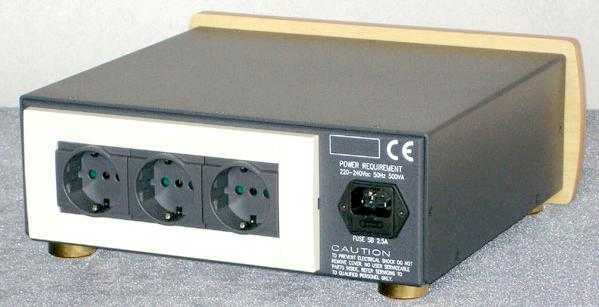 It should also reduce or eliminate those buzzing transformers you get, especially the big ones in power amps when there is a DC element in the mains and when there are big changes in voltage. The actual construction for such a transformer is the same as for any other transformer, but instead of one coil 'stepping-up' or down to another in order to change voltage, the two coils are the same size and so there is no voltage change, but in the transfer of the current from one to the other the filtering occurs. Obviously true isolating transformers like the Enlil are specially wound to maximise this filtering. This also means that the resultant power output is 'balanced', there is no longer a 'live' (240v) and "neutral" (0v) but two 120v lines 180 degrees out of phase producing the required sine wave. Before I leave this technical (most of it 'lifted' - I don't understand a word...) section I'll point you to the net where you'll find loads of info on the subject, not least on ESE's own website. At the back you'll see the input along with three outputs, these are obviously high quality. At 9 kgs it's a heavy beast but not a backbreaker. Rated output is 500va, plenty for your hi-fi except for big power amps - here you may wish to have a separate Enlil or even go for a heavier duty model like the Pure-Powers' 1 Kva. 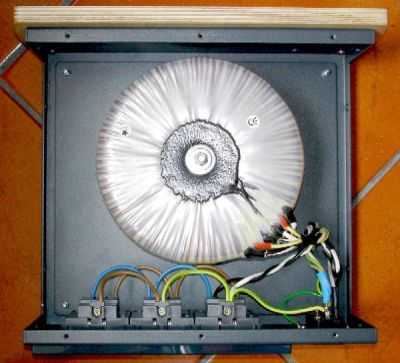 Inside is the transformer itself - a large toroidal job specially wound for the purpose. Here we're into a bit of an odd review. You see, my system has always had an isolation transformer in line for all but the power amps. This Pure-Power has just sat in line and filtered all incoming mains, to all review equipment, for every review I've done. Now you see the problem, I've had to 'unlearn' what my system sounds like with the Pure-Power! Taking the Pure-Power out of the system immediately made it prone to more "pops!" from the mains and of course the transformers began their happy buzzing whenever the local farm started milking... 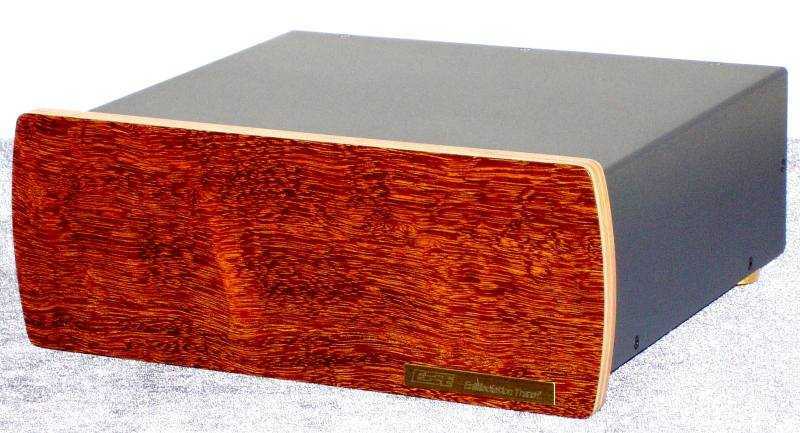 In the past I've used Naim amps and they buzzed so badly that sometimes I'd fear they'd rattle right off their shelf. The Pure-Power stopped all this, though my Audionote power amps don't suffer in the same way even when not used with the Pure-Power. But something else happened. Years ago there used to be an add on British TV for teabags - the byline was "lets the flavour food out" - you have to imagine the Yorkshire accent... What a really good isolation transformer does in my system is replace "flavour" and replace it with "music". You can see I'm ducking the issue a little here, because the difference is difficult to quantify in words but easy to hear... OK here goes... Take either isolation transformer out of the system and the music takes on a grey, flat quality, dynamics seem squashed and the subtle colouring and texture lost. I guess this is because of a loss of background hash, but as much of this is at radio frequencies it must also be that this filtering gives the electronics themselves an easier time. This difference is easily large enough to hear in a back-to-back, but really manifests itself (to me) in the system sounding 'right' - take the transformer out and somehow I get fidgety and feel something is missing. And unlike a cable upgrade, or single component, this improvement extends to all the equipment plugged into it. The largest difference was it's effect on preamps and phono stages (more on this later) and the smallest on the power amps, though all benefited to some extent. So I'm a fan of good isolation transformers (not all are equal...) and both the Pure-Power and the Enlil are evidently excellent. And here we get to my problem because in essence the conclusion I have to draw is that my system sounds pretty much unchanged when I put the Enlil in line! BUT it's a hell of a lot better than straight, unfiltered mains! What in theory should have been a simple and short review became a nightmare of swapping components, isolating transformers and cables - I don't want to think of all the possible combinations but I guess they'd run into the hundreds and no I didn't have time... However I did come up with some interesting conclusions. First and most surprisingly was the effect with the Nibiru phono stage. Yup that battery powered phono stage that won me over a while back. Obviously during that original test that stage just got plugged into the system and was automatically filtered by the Pure-Power. Removing all such filtering made an audible difference to the stage, it just didn't sound to clear and open. Fearing a severe attack of placebo I contacted Rudi at ESE and asked him how on earth this should be. He replied that it should make a difference because though the gain stage of the Nibiru is battery powered the control circuit and LED were powered up from mains via a continuously operating power supply. Sheesh! He then went on to say one customer used three 'stacked' Enlils for his Nibiru, each addition making a further improvement. So this prompted me to try running the Pure-Power into the Enlil and then to the hi-fi. Yes, this was the best solution and was overall better than using the Pure-Power for say the power amps and the Enlil for the various low powered components, or any other combination. ESE say ideally a system should have several Enlils both in series and for individual components (they would say that though) but on my limited experience this certainly would seem to have some foundation. So how did the Enlil stack up against the Pure-Power? Well here I've got to be honest and say I couldn't tell them apart. The bigger capacity of the Pure-Power would be better for a muscle system, but otherwise they were very similar in absolute performance terms (here I'm talking audible performance, I don't have an oscilloscope). But that said the Enlil racked up a lot of advantages of its own. It has three rather than two outputs. This might sound a minor matter, but three is enough for a basic one-source system, two probably isn't, and so the Pure-Power must rely on a gang socket. These inevitably have a detrimental effect on sound and the better ones are very expensive. Two Enlils would power an entire system and probably cost only a little more than the Pure-Power and a hi-end gang socket. The Enlil is also smaller and lighter and yet, as it is attractive in itself, it doesn't need to be hidden away like the battleship-grey Pure-Power. It also proved much quieter in operation. This is important because though the Pure-Power stopped even Naim amps buzzing, it did produce a fair amount of the same mechanical noise itself (not helped by the big resonant box), so much so that I'd considered moving it out of the listening room - rather defeating the object. The Enlil was always very quiet and so didn't draw any attention to itself. One thing I didn't try was the effect of the Enlil with a synchronous-motor turntable (as both mine are DC) - here the effect should be positive, and ESE will advise purchasers on how they can modify the power supply of such turntables to make the most of the advantage. Obviously 1:1 isolation transformers are a permanent fixture in my system. Like any other component the results will be system dependent - some components are better isolated than others - and of course it'll depend heavily on just how bad your mains supply is. One thing is certain though - with more and more RF interference, talk of sending computer data and even TV pictures down the mains supply, the situation everywhere can only get worse.